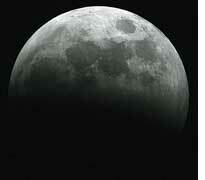 a lunar eclipse is considered very special astrologically. It is revered as a propellor of life-changing events. Now scientists revere it too--the light that is reflected back from the moon during the eclipse carries clues indicating the presence of life on a planet. Astrobiologists are excited. A lunar eclipse, on August 16, 2008, provided an opportunity to a team of astronomers headed by Enric Palle from the Institute of Astrophysics, Spain, to prove the new theory. Some amount of sunlight passed through the edges of the earth and onto the moon from where it was reflected back into the earth. This light was then analyzed. Since gases in the earth's atmosphere absorb different wavelengths of light, the analysis revealed the presence of ozone, oxygen, water vapour, carbon dioxide and methane which are indicative of life here. The sunlight reflected back from the earth every day can provide the same information. But by the time this light can be analyzed by telescopes, it is faint and an accurate analysis is not possible. Also, reflection of sunlight varies because of two factors: changes in the earth's surface and changes in cloud cover. These factors did not interfere much with the light that escaped during the eclipse because it was transmitted into the earth, and not away from it, making it easier for analysis. Capturing such light emissions of other planets during space missions might soon be possible, said the authors of the study. If gases similar to the ones in the earth are found in those planets on analysis, it may indicate the presence of life, explained the study in the June 11 issue of Nature. Ranjan Gupta, professor at the Inter University Centre for Astronomy and Astrophysics, Pune, is not very confident about the application. "Even if they find a similar transmission spectrum in those planets, it might not necessarily mean the presence of life. Many other factors are essential to conclude that, such as the planet's distance from its star as well as the surface temperature of the planet."